I'm slowly working my way through my library's Revolutionary War offerings, given my obsession with Hamilton. I had a difficult time with this audiobook, as the reader (who has won numerous awards) was hard for me to understand. His voice was so very deep that sometimes it was hard to listen to in a casual way; it tended to take a lot of effort to listen to sometimes. But that was the only drawback. The book looks at the events during a few months of 1776, which was the end of the beginning of the patriot cause and the beginning of the end of England's war. What I really liked about this book was that, unlike others I've read, it focused on both the political and battle side of things at the same time, showing how the two intertwined. I got a better idea of how actions on one side led to actions on the other, how they fed off each other, and how different their objectives were. I had no idea about a lot of what went was discussed; textbooks in history class tended to concentrate on what happened and not why or how. I loved seeing the personal sides of many of these historical figures--Adams being tasked with overseeing an army with no military experience and while worrying about his family during a Smallpox Epidemic, George Washington trying desperately to make moves with an army that was just trying to figure out how to army, and the Howe brothers not having the benefit of looking back and seeing what moves they should have made at the time. What a strange culture these men all had to live and work in. Those in charge of the English forces had power but were also supposed to be peacekeepers. Those on the patriot side were supposed to be loyal to their king and could only get ahead by using tricks and tactics while still having to be honorable men. George Washington not wanting to retreat but not wanting his men to die was so powerful. I also liked how honest the book was about public perception. The newspapers didn't always print accurate information (or any information). It was hard for people to show they believed in the cause, because they could be killed or imprisoned as traitors. And definitely parts of the American victory was due to luck as much as the many other factors. Many people thought of revolution as inevitable, but some didn't. In addition, I liked that this book started out with several notes about the culture, such as the code of honor men operated under. Without that understanding, many of the actions wouldn't have made sense to me with my modern mindset (and the benefit of hindsight). It also went into detail about why the patriots faced so many different difficulties--not being able to create an army the same way the British could, not having funds, not having support of the people they were fighting for, not being able to agree on what they were trying to build or how much power the new government could have over the new state governments. Given all the struggle, it's a wonder America even became America! 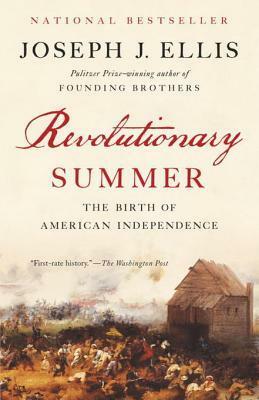 This was a great look back at the events that helped create and shape the Revolution. I really enjoyed it.